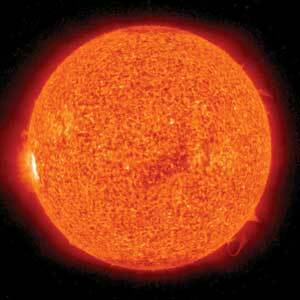 Activity on the sun, shown here in late April, is waning, but the next storm is expected to begin in March 2008. Although the new cycle is predicted to be moderate in intensity, scientists warn that it may still strongly impact space-based technologies. Scientists gathered on April 25, 2007, to announce predictions for the sun’s next cycle of sunspots and storms, slated to begin in March 2008. Forecasts for upcoming space weather are moderate, but the sun’s impact may still be powerful: With an increasing reliance on technologies based in the upper atmosphere, the scientists warned, society has become more vulnerable to the effects of solar storms than ever. That concern was borne out last December, when two powerful solar flares disrupted the Global Positioning System (GPS) and other communication technologies across the planet — at a time when solar activity was expected to be generally decreasing. Such communication technologies rely on being able to transmit and receive radio waves across vast distances through the uppermost part of Earth’s atmosphere. The flares injected high-energy particles into the sun’s upper atmosphere and produced radio waves that headed rapidly toward Earth. The arrival of the burst of radio emissions in December swamped GPS receivers and created unprecedented levels of “noise” across a broad range of frequencies. This event marked the first time researchers were able to accurately record how much effect such bursts had on GPS receivers — and suggests that even worse may be to come in a few years, when the new solar cycle approaches its maximum. The new cycle, labeled “Solar Cycle 24,” is already slightly behind schedule and is now expected to peak around October 2011. This delay has made predicting the storms’ intensity more difficult, Doug Biesecker, chair of a panel of scientists charged with making the predictions, told reporters April 25 at NOAA’s annual Space Weather Workshop in Boulder, Colo. The panel, which consists of 12 members from NASA, NOAA, the International Solar Energy Society and other agencies, began analyzing a wide range of predictions about the upcoming sun cycle last October, during the previous cycle’s waning period. During a full solar cycle, the sun’s activity increases, peaks and then decreases, typically over a period of 11 to 12 years. That cycle coincides with the appearance of dark, lower-temperature areas on the sun’s surface where the magnetic activity is particularly intense. Scientists believe that these “sunspots” may be the source of solar flares, which are sudden eruptions of energy that can shower Earth with charged particles and bursts of electromagnetic radiation. Earth’s protective magnetic field shields much of the planet from this radiation, but particularly strong flares can make the magnetic field fluctuate, producing geomagnetic storms that can disrupt communications and navigation systems. In addition to navigation systems, such flares can have significant consequences across many sectors, said Joe Kunches, head of the Forecast and Analysis Branch of NOAA’s Space Environment Center. Satellites in low orbit around Earth are vulnerable to this radiation, which can cause Earth’s upper atmosphere to swell somewhat, interfering with the satellites’ orbits. Solar flares can also endanger astronauts by exposing them to potentially lethal radiation, and can even increase radiation dangers to pilots and passengers flying at very high altitudes. Scientists, however, are still divided over the predicted intensity of the next solar cycle. Given in numbers of sunspots per year, the two competing estimates for maximum activity are 140, peaking in October 2011, and 90, peaking in August 2012. Although certainly different, both estimates are relatively moderate, Biesecker said: In comparison, the most active period in the past 100 years occurred in 1956, when sunspot activity averaged about 200. No matter how intense the storms are, scientists are keeping a weather eye out for their potential impact, the panel said. Even during a solar minimum, the danger is still present, as evidenced by the strong solar burst last December. That incident, scientists warn, could be just one sign of things to come. This story first appeared on Geotimes online at www.geotimes.org April 30, 2007.